Young Ambassadors Emily, Grace and Laura with their RE teachers, Lynsey Wilkinson and Holly Smith. On Monday 6th June 2016, RE Ambassadors from all around the country gathered together for the annual Young Ambassadors’ Conference. It was, as always, a privilege to work alongside other young people who share the same commitment and motivation as we do. We were treated to a wonderful keynote speech from Lord Robert Winston. He really made us think about the connections between science and religion. We are still discussing his views on whether humans’ intelligence should be used to perform procedures such as organ transplants. His interpretation of Genesis 1:26 really challenged us to think outside of the box. We also loved the way he used artwork of William Blake and sketches from Galileo to help explain some of his ideas. In the second part of the conference, every school team got the opportunity to present their research on a minority faith and how it could help people prepare for life in modern Britain. It was obvious how much time and effort the Ambassadors had put into making their presentations accurate, engaging and specific to the brief. It was a pleasure not only to present but also to listen and learn from other ambassadors. 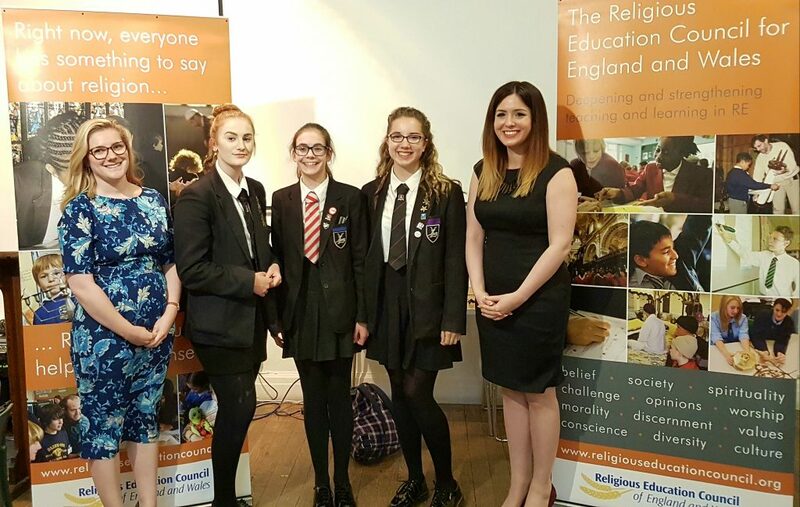 The RE Council provided a unique and wonderful opportunity to meet other Ambassadors and discuss topical issues facing the future of religious education. We are especially thankful to Helen Harrison for all of the hard work she put into organising the event.